Hundreds of thousands of Salvadorans will soon be at risk of deportation — just the latest injustice they've suffered at the hands of the US state. 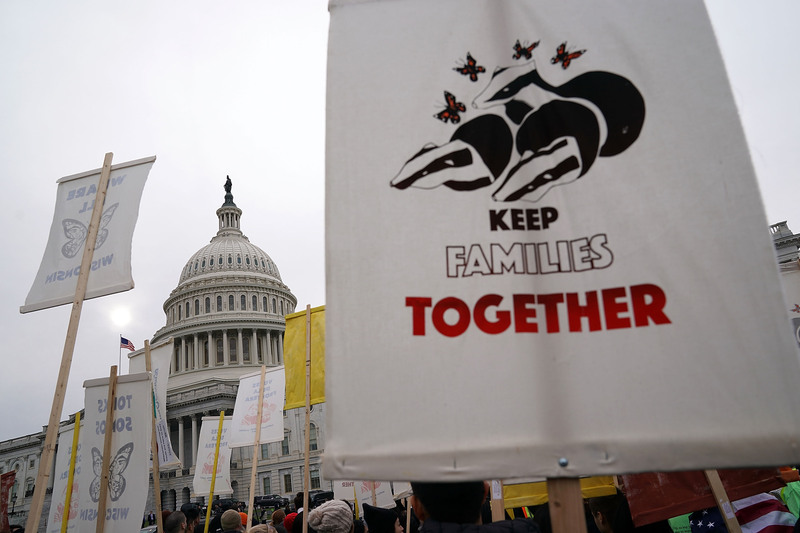 On Monday, the US Department of Homeland Security (DHS) announced it was terminating protections that have shielded over two hundred thousand Salvadorans in the United States from deportation for nearly twenty years. After a final eighteen-month extension, Salvadoran Temporary Protected Status (TPS) holders will join the ranks of over a million US residents newly vulnerable to deportation under Trump. They and their families have been thrown into chaos, twice uprooted by the machinations of US empire, with only a dysfunctional Congress to look to for relief. DHS’s decision came nearly seventeen years to the day after the first of two massive earthquakes devastated El Salvador, prompting US officials to grant Temporary Protected Status to thousands of undocumented Salvadorans then residing in the country, most of whom had fled the violence and destruction of El Salvador’s twelve-year, US-backed civil war (1980–1992) and its aftermath. Salvadoran TPS recipients were refugees, but the United States had refused to grant them that status, unwilling to recognize that the Salvadoran military dictatorship — a principal US ally in the bloody anticommunist campaign in the region — committed vast and egregious human rights violations. Along with other concessions won thanks to the organizing of Salvadoran refugees and their supporters, TPS emerged as a partial and entirely inadequate response to this problem. The program must be renewed by DHS every eighteen months, at great cost to the applicants, and beneficiaries are barred from applying for permanent residency. Salvadorans comprise the vast majority of immigrants covered under the program. Already, the Trump administration has canceled TPS program for 60,000 Haitians, 2,500 Nicaraguans, and 500 Sudanese, with 60,000 Hondurans likely to face the same fate. This is on top of the 800,000 young people, majority Mexican, who will be rendered undocumented when the Deferred Action for Childhood Arrivals (DACA) program expires in March. Hostage to the political climate in the States, uncertain TPS holders and their families have been something of a political football for nearly two decades, with Republican threats to terminate the program routinely leveraged for electoral gain by the reactionary right in El Salvador. With elections on the horizon in El Salvador, Trump’s decision comes like a match to kindling. Already, Trump’s anti-migrant attacks were being manipulated by the far-right opposition to smear the governing Farabundo Martí National Liberation Front (FMLN), the party of the former leftist insurgency, for its support for the embattled Maduro government in Venezuela. Just a week earlier, a likely FMLN presidential candidate drew fire for speaking at a university rally in solidarity with Honduras in which a banner reading “Yankee Go Home” was draped across the stage; the US ambassador scolded the Salvadoran public on Twitter for the slight, and the corporate media suggested (falsely) that the incident threatened to torpedo both US aid and TPS renewal. Now, campaign season has officially opened for the March 2018 midterms, and all parties are gearing up for the 2019 presidential vote. The government has sought to calm the public and cast the eighteen-month extension as a qualified achievement, while the US embassy hands out pamphlets on moving to El Salvador for the newly deported. Opposition candidates from the right to the center are tripping over each other to blame the FMLN and claim that their election would reverse the DHS’s decision. All agree that the country, 16 percent of whose GDP is comprised of remittances from the United States, is in no condition to absorb two hundred thousand longtime US residents and their families. But despite the opposition’s shrill intonations, the termination of TPS for Salvadorans was not a response to unfavorable local politics. Rather, as the president’s recent “shithole” remarks confirmed, this cruel and irresponsible decision is consistent with the administration’s extremist, white-nationalist project, the victims of which span the width of US imperial engagement, from the Middle East to Central America. Unfortunately, the crisis has prompted many in the United States to adopt, out of desperation, an insidious discourse of deservingness. TPS holders insist that they are not criminals or gang members and portray themselves as upright seekers of the American Dream; advocates rattle off statistics demonstrating migrants’ contributions to the US economy. This rhetoric, which divides the population into “good” and “bad” immigrants, only weakens the struggle for a radical and inclusive migrant justice. So too does the privileging of “Dreamers” in the current immigration debate. The January 8 DHS decision briefly thrust Salvadoran TPS holders into the limelight, as it did a few weeks ago for Haitian TPS holders. Yet these populations remain marginalized from the mainstream discussion about immigration, upstaged by the Dreamers, who even Trump can admit appear to merit consideration. Even as DHS slashes TPS for hundreds of thousands of immigrants, the White House is trying to ransom protections for DACA recipients in exchange for further border militarization and enforcement. As all eyes turn to Congress, it is imperative that any discussion around immigration also include those who have benefitted from TPS. Organizers with the National TPS Alliance are fighting for legislation that would provide a path to legal permanent residency for all TPS holders. While representatives on both sides of the aisle have introduced bills that would shield certain populations, the American Promise Act, sponsored by New York Democratic congresswoman Nydia Velazquez in the House, encompasses all TPS nationalities and, importantly, is a “clean” bill, with no border enforcement strings attached. TPS, like DACA, was an insufficient response to a crisis born of decades, if not centuries, of US military, political, and economic intervention in the region. The only just response today is to provide secure and regular status to all within our borders — documented or not. No wall, no more agents, just residency: now.